You can't talk about the true greats of folk-inspired melodic death metal without reverent mention of ENSIFERUM, and with their recent album Two Paths they once more affirm their place in the pantheons of the genre. Further building upon the thrilling metallic hybrid honed across six full-lengths, Two Paths is simultaneously the Finnish quintet's most epic and far-reaching collection and their most organic, which definitely sets it apart from the pack. With One Man Army standing as the band's most accomplished effort to-date, going into the process of following it up, the members were able to place faith in the intuition of each other, all driven to deliver the best record they could. For Sami Hinkka (bass/vocals), Markus Toivonen (guitar/vocals), Petri Lindroos (vocals/guitar) and Janne Parviainen (drums), this trust has steadily grown and strengthened with every release. With Two Paths the care and attentiveness the band invests in everything they do shows, they maintain an enviably high standard. It is also a record with energy to spare, practically daring the listener to resist being caught up in its infectious liveliness. Whether it's the breakneck, ultra-catchy thrashings of "For Those About To Fight For Metal" or "King Of Storms", the crunchy stomp of "I Will Never Kneel" or the surging thunder of the title track, they never fail to grip, and when they slow things down – as on the cinematic "Hail To The Victor" – they somehow manage to sound even bigger. Likewise, the grandiose, heroic themes that have always run through ENSIFERUM 's records! Now it is Australia's chance to catch the band at their absolute peak! One of the biggest names and leaders in folk metal are on their way and ENSIFERUM promise you a night of beer drinking, fists in the air… just one big metal party.
' 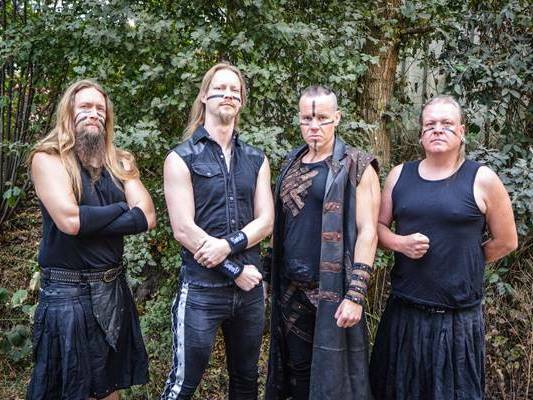 As is typically the case, ENSIFERUM will be entering into an extensive touring campaign in support of the record, their calendar already full for the next year. Having accomplished so much since dropping their self-titled debut full-length back in 2001, their appetite has not dulled, wanting to reach more and more people with every successive release, yet they remain characteristically grounded.